We can help. Our Santa Cruz personal injury law firm has the experience and success with product liability cases that you need. You may deserve compensation. Strict product liability allows the injured consumer to pursue an action for damages against all those in the chain of distribution of the product, i.e., not only manufacturers, but also wholesalers, distributors, retailers, and designers of the product. Consequently, even though one entity in the chain of distribution of the product may be out of business or bankrupt does not prohibit someone injured by a defective product from receiving compensation. What types of product defects are there? Before reading the following information, you should review our “What to do if you are in an accident” page. 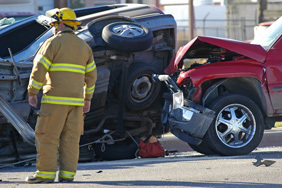 Much of the information there will answer many of the questions you may have about your automobile accident. In particular, the information regarding what to do following an accident, preserving evidence, seeing a physician, taking photographs, preserving your wrecked vehicle, the time within which to take legal action, whether to speak with insurance company investigators, and hiring a lawyer also applies to injuries from a defective product. What kinds of products have been known to have design defects? Obviously, the list of potential products which may have “design defects” is virtually endless. Claims for design defect can range the gamut of products, from cars, trucks, planes, household products, work machinery, toxic chemicals, prescription drugs, pesticides and medical products of all types. For example, the attorneys at SS&F have sued automobile manufacturers because a car with bad design lacks sufficient “crash worthiness”. Claims of this type have been made where vehicles–especially SUVs and vans–are designed which are unstable, tend to roll over, are unacceptably susceptible to roof crush, lack sufficient restraint systems, have fuel tanks susceptible to explosion, or other such unsafe design defects. Serious injuries due to defective designs of such vehicles can lead to traumatic brain injuries, spinal cord injuries, or even wrongful death. SS&F are among the most knowledgeable in the country regarding the cardiac risk associated with TASER devices. Despite assurances by TASER International, Inc. to law enforcement officers that the TASER electronic control device (“ECD”) is “cardiac safe”, when an individual is shocked with a TASER in the chest, or shocked multiple times by a TASER, there are significant risks that the individual can suffer cardiac arrest, resulting in anoxic brain injury, or even wrongful death. In addition to the more commonly known medical products which have been alleged to cause serious health problems, such as breast implants, Fen-Phen, and Sulzer knee and hip replacements, there are a large number of prescription drugs and ingredients which may cause serious side effects. These medications and ingredients include Avandia (heart attack/stroke), Accutane (depression/suicide), Adderall and Ritalin (heart attack/stroke), Fosamax (osteonecrosis of jaw), Ketek (liver damage), Orthoevraz patch (blood clots), Seroquel and Zyprexa (diabetes/neuroleptic malignant syndrome), Zelnorm (heart attack/stroke). What you should do in defective product cases. As was explained in our “What to do if you are in an accident” page, in products liability cases it especially important that an immediate investigation be conducted. Additionally, it is crucially important that the product, of whatever kind, be preserved. Whether the case involves a potentially defective automobile or prescription drug, the product must be preserved, and all documentation, including warnings, manuals or instructions must be maintained. Regardless of the information which an experienced attorney can obtain through informal investigation, government or independent literature sources, or even the formal discovery process, expert advice and testimony is crucial in understanding, explaining and proving a products liability case. Often times it is necessary to perform destructive testing on exemplar products in order to prove that the one which caused the injuries was defective. This process is a time-consuming and expensive one, but necessary to prove the case.